Special Order. May not be available. Call the store for details. The clanging of a streetcar's bell conjures images of a time when street railways were a normal part of life in the city. Historic Canal Street represents the common ground between old and new with buses driving alongside steel rails and electric wires that once guided streetcars. New Orleans was one of the first cities to embrace street railways, and the city's love affair with streetcars has never ceased. New Orleans: The Canal Streetcar Line showcases photographs, diagrams, and maps that detail the rail line from its origin and golden years, its decline and disappearance for almost 40 years, and its return to operation. 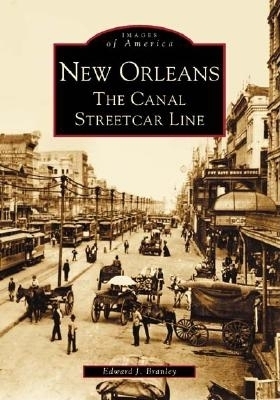 From the French Quarter to the cemeteries, the Canal Line ran through the heart of the city and linked the Creole Faubourgs with the new neighborhoods that stretched to Lake Pontchartrain.